“I started farming about six years ago as a hobby,” says Rodette Jones. Initially, she just needed an outlet to relieve the stress associated with her job as a police dispatcher. She began with light gardening around the home, planting mostly flowers and focusing on the aesthetic appeal of gardening; then she became a volunteer with the Filbert Street Garden and everything changed. At Filbert Street Garden, Rodette developed a deep interest in growing food. 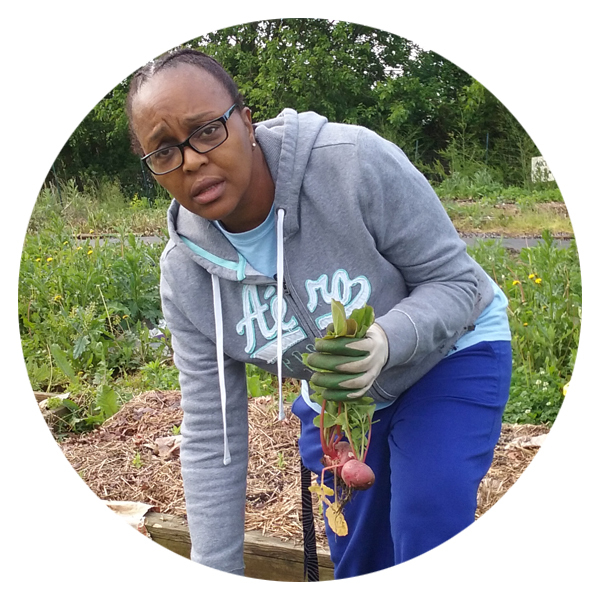 As she worked closely with Jason Reed, an Open Society Institute (OSI) fellow who spearheaded the community garden, she became more invested in all aspects of farming. She started to take more workshops that only fueled her farming fascination. “As I learned more, the more empowered I became, and the more I wanted to share what I was learning with others.” Now Rodette coordinates many of the garden’s farming workshops and events for kids. Her relaxation hobby is now her full-time passion. She has become an inspiring force for many new grower, including her mother and sister. The latter who has ventured into growing food also. Rodette would like to hold more workshops to show kids how to cultivate the soil and understand the importance of growing things. She would like to see more kids starting their own gardens at home, and for kids to understand how to be less wasteful by re-purposing food scraps and composting.